He never intended to specialise in weeds, but coming from an active natural history family and after successfully trashing any chance of pursuing science thanks to a misspent youth, the inevitable happened; after getting involved in the bush regeneration scene in Melbourne in the early '90s (with a colourful but quite useless art degree in tow) he became permanently entangled with invasive species. Initially in a very on-your-knees Bradley sisters kind of way, but as the issues grew into landscape-scale problems herbicides found a place in his operational toolkit as well. The rest, as they say is history, some quite recent. 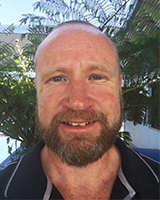 He stepped out of the tropical rainforests after leading operational teams chasing Miconia, Koster's Curse and others in 2008 and has been working at translating his operational learnings into strategy, GIS, communication tools and advocating for appropriate resourcing for invasive species management. These days he continues to tread a fine line between art and science which effectively ensures he rarely excels at either.